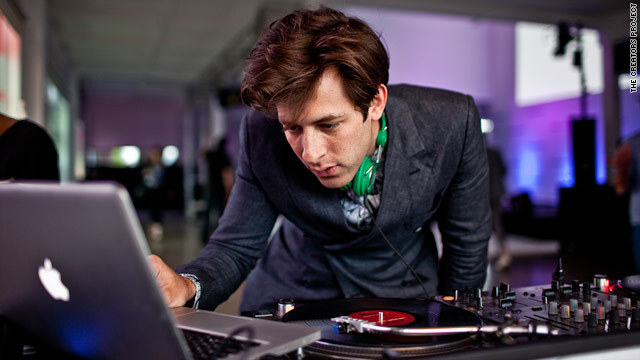 Mark Ronson performs at a launch event for the Creators Project, the first of five global conferences highlighting art and music. (CNN) -- Between the recent unveiling of Apple's iPhone 4 or Microsoft's trendy Kin touch phone, people can constantly be in touch. Amid the digital revolution that has grandfathers asking for iPads and Nooks, city dwellers to those living in rural areas have the potential to constantly be up-to-date and in the loop, if they have access to the technology. To shrink the gap -- even if just for one day -- the folks at Intel and the underground cultural surveyors at Vice teamed up and are kicking off the Creators Project, a creative experiment of sorts Saturday at Milk Studios in New York City. "For the first time in history the kids know the same thing about music, fashion and art because of the internet," said Shane Smith, founder of Vice. "But wouldn't it be great to be a part of all the scenes?" The 12-hour cultural expression extravaganza promises to deliver innovative film, fine art, and multimedia exhibitions, the common denominator being technology. "I think it comes down to the art of possibilities," said Deborah Conrad, vice president and chief marketing officer for Intel. "It's about giving people access, and a way to express themselves. Just because there's a guy in Oklahoma, doesn't mean he can't participate." The one-day-only lineup includes panel discussions, workshops, and live performances by the likes of super music producers Diplo and Mark Ronson, plus a screening of Spike Jonze's short film, "I'm Here," a love story about the relationship of two robots living in Los Angeles, California. Following Saturday's event, the show travels to London, England; Sao Paulo, Brazil; Seoul, South Korea; and Beijing, China. At a time when digital technologies have revolutionized distribution and access to the arts, coupled with a struggling economy depleting funding for the arts, the Creators Project aims to give people access to the arts and inspire others to get creative. Organizers hosted a test event in France a year ago where more than 10,000 people lined up around the block in the rain to attend, recalled Smith. "It was nuts, and we've had some crazy parties, but I've never seen that," Smith said. "If you're not in with the cool kids you're screwed, and so we want to create a network that can support the (independent) artist." The "indie scene" is where culture evolves from; it's where dynamic change comes and yet is one of the most unsupported scenes, said Diplo, who produced the Grammy Award-winning song "Paper Planes" for M.I.A. "I grew up in a small town in Florida, and I was always trying to do things creative and pushing the envelope," Diplo said. "I think America has always been lacking in supporting wacky stuff ... but I feel it (Creators Project) is amazing." The all-star lineup is building some healthy competition, too. So much so, Mark Ronson, who has produced albums for the likes of Amy Winehouse, Ghostface Killah and Lily, is keeping his performance under wraps, he said. "I'm as much as a fan as I am a creator. It's this super group of the arts and it's exciting," Ronson said. "We're all creators of a digital age, and combining these creative geniuses is what is going to make it what it is."